Hezbollah has been in the news over the past few weeks for two issues: its alleged responsibility for a suicide bombing in Bulgaria, and the spillover effects from the civil war in Syria. On 19 July last year, a suicide bomb gutted a tour bus near Burgas Airport in Bulgaria, killing five Israeli tourists and the driver (and bomber) and wounding 32. Suspicion immediately fell on Iran or Hezbollah; among other indications was that the attack came on the 18th anniversary of the bombing of a Jewish community center in Argentina that killed 85, which has been linked to Iran. Last week, the Bulgarians issued a report accusing Hezbollah’s military wing of carrying out the bombing, revealing that the three suspects had entered the country using Canadian and Australian passports. (Note: the Hezbollah teams that pursue Jake and Miriam in Doha 12 are part of the Party of God’s military wing, and Jake tells Miriam about some of Hezbollah’s previous operations in Europe when they first meet.) The Bulgarian government has forwarded a copy of this report to the Lebanese government, and the Foreign Minister will meet with his European Union counterparts on 18 February to discuss sanctioning Hezbollah. Hezbollah has largely refrained from attacks in the West since 9/11. For a good discussion of what’s changed, Matthew Levitt of the Stein Program on Counterterrorism at the Washington Institute for Near East Policy writes an opinion piece reviewing the state-of-play between Iran, Hezbollah and Israel over the past few years. …which it needs now more than ever. Its long-time sponsor Syria is on the ropes and Iran is increasingly constrained in its ability to provide significant military aid to Hezbollah. However, it appears that Hezbollah and Iran are attempting to lay the groundwork for keeping some level of influence in Syria by organizing sectarian militias to protect the Shia and Alawite minorities in that country. This is a reprise of Iran’s sponsoring of Shia militias in Iraq following the 2003 American invasion. 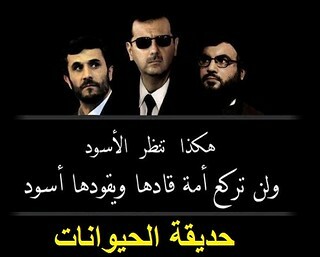 It can also be seen as a vote of no confidence in Bashir Assad’s increasingly rickety regime; Assad’s last two friends in the Mideast would hardly feel the need to set up alternative power structures if they thought his government could survive the now two-year-old rebellion. The prospect of being cut off from both Europe and Syria has got to be keeping Hezbollah’s leaders awake at night.